How was your weekend? Hopefully as beautiful as mine was. I found myself back home and getting back into wedding planning after a week or two off. 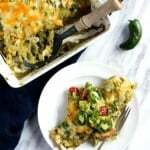 Someone get me a margarita and a giant piece of this cheesy veggie packed enchilada casserole. So, what is a casserole? It’s basically just a bunch of things thrown into a dish to get all the flavor and sauces baked at once, not only for ease, but also to make the food 100x more delicious. Just trust me when I tell you these things. Casseroles aren’t just any old thang to throw around though. They can really be anything you want them to be as long as you know how to put it together correctly: Hispanic, Italian, Greek, Thai, American. It’s all about the ingredients you use and the flavors you put together. You can add rice, noodles, tortilla, bread. You can also make them for breakfast (thing french toast casserole). FABULOUS. 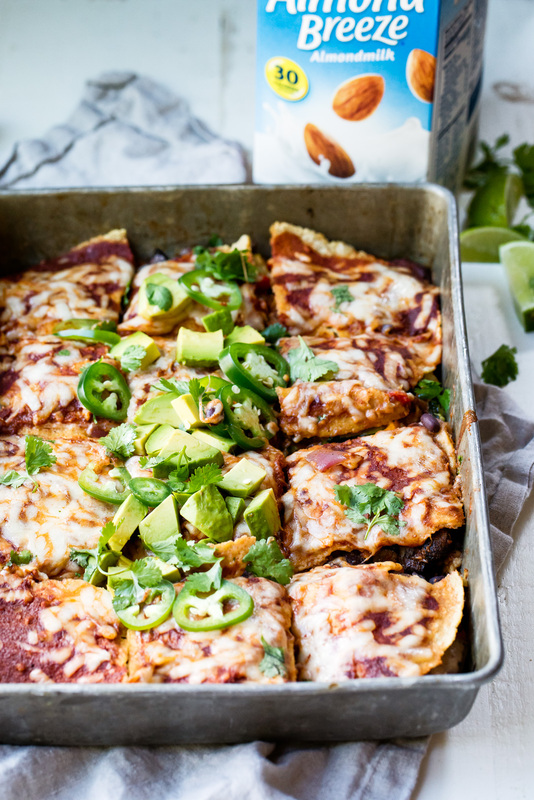 Today I’m making you one of my favorite meals on this earth: ENCHILADA CASSEROLE. My mom used to make it all the time for church gatherings and parties when she didn’t want to roll up tortilla for enchiladas. It’s a crowd pleaser or a homemade weeknight dinner. AND SO EASY TOO! 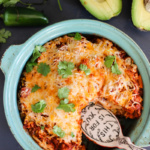 This one in particular is made with a life changing homemade creamy enchilada chipotle sauce. A simple mix of ingredients including tomato sauce, chipotle chiles in adobo, Almond Breeze almondmilk, and other spices. Perfect for slathering on scrambled eggs, throwing in burritos, slow cooking chicken in OR drizzling all over your enchiladas. 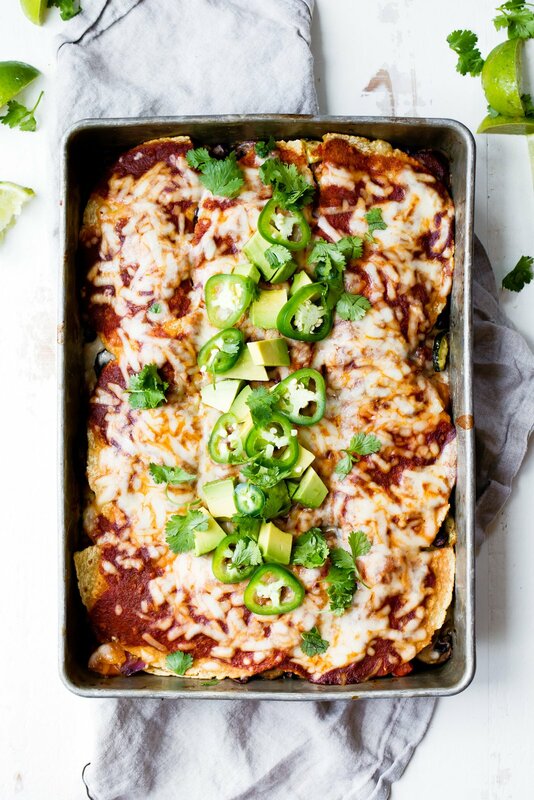 I opted to make this version vegetarian because I had recently been to a Mexican restaurant that served mushroom and cheese enchiladas and they were SO ridiculously good. Anyway, roasted veggies = the best thing ever, especially in enchiladas. To keep it dairy free, simply use a dairy free cheese or you can leave out the cheese completely, but I think it adds nice flavor. Plus meltyyyy cheese = gold standard in my enchilada book. Oh and I ususally use corn tortilla, because it’s just my preference flavor wise, but you are welcome to use whatever you like. And guess what? I’ll be making this recipe on Facebook Live this Tuesday, July 25th at 3pm CST. Be sure to tune in on my page. I hope you guys love this vegetarian meal and get a chance to make it soon! Please leave a comment below if you make it and/or upload a photo and tag #ambitiouskitchen. 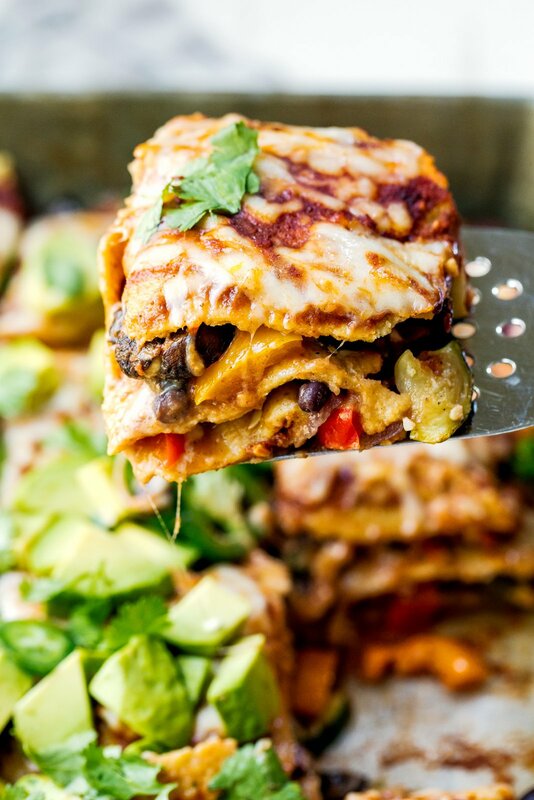 Layers upon layers of veggies snuggled between black beans, corn tortillas, a homemade chipotle enchilada sauce and cheese. 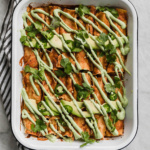 The best and easiest vegetarian enchiladas! STEP 1: Preheat oven to 400 degrees F. Line a large baking sheet with parchment paper, or you can also line two smaller baking sheets if that’s all you have available. 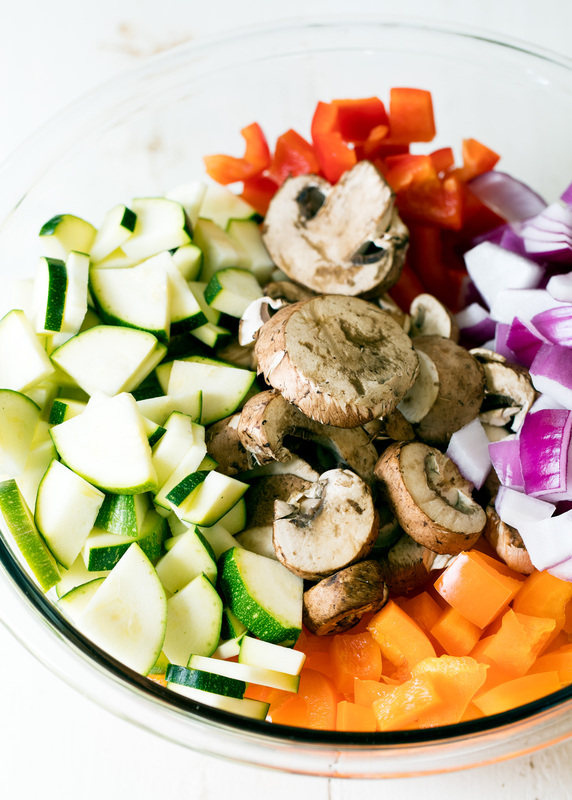 Place diced bell pepper, diced onion, mushrooms, and quartered zucchini on prepared baking sheet(s). Drizzle with olive oil and toss garlic on top. Generously toss with your hands to coat the veggies with garlic and oil. Roast vegetables for 20-25 minutes. STEP 2: While the veggies are roasting prepare the chipotle enchilada sauce: In the bowl of a food processor, add the sauce ingredients and process for 30 seconds or until smooth. STEP 3: Reduce heat in oven to 375 degrees F. Grease a 9x13 inch baking pan with nonstick cooking spray. Add 1/2 cup enchilada sauce to the bottom of the pan and spread out evenly. Place 3 corn tortillas over the sauce. You may need to cut one tortilla in half to create a single layer. Next add ½ of the roasted veggies and half of the black beans on top of the tortillas. Then drizzle ½ cup of enchilada sauce on top followed by 1/2 cup of shredded cheese. 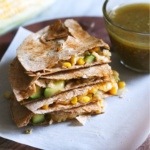 STEP 4: Repeat the layers again, starting with the 3 corn tortillas, remaining veggies and beans, ½ cup enchilada sauce and 1/2 cup cheese. STEP 5: Finally add 3 more corn tortillas on top to evenly cover the veggies and beans, then top with remaining enchilada sauce and 1 cup cheese. Bake for 20-25 minutes or until cheese is melted. Serves 6. To make dairy free: Use a dairy free cheese. This post is in partnership with Almond Breeze Almondmilk, a brand I love and have partnered with for years. Thanks for supporting AK and the brands that help make this site possible. 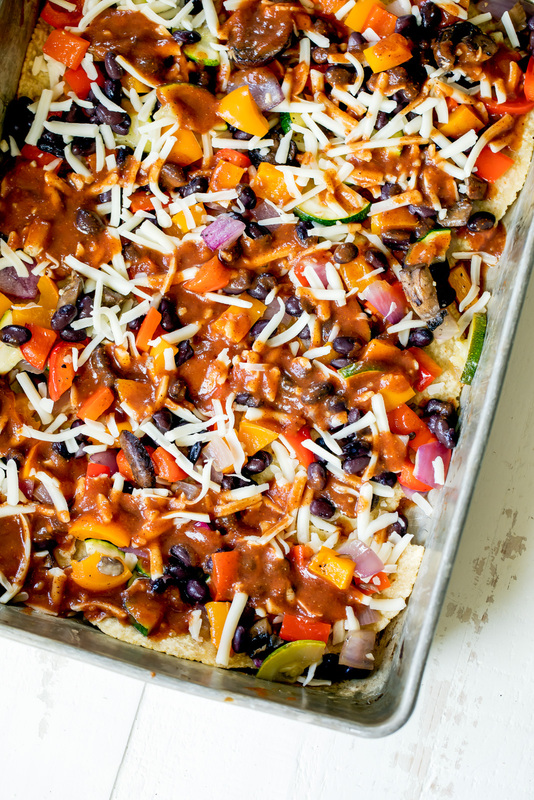 51 Responses to "Chipotle Black Bean Roasted Veggie Enchilada Casserole + video!" Adobo sauce is a sauce that comes with the canned chipotles. The sauce itself is a sweet and tangy purée of tomato, vinegar, garlic, and some other spices! Love this idea! Sounds so yummy!! I can’t wait to meal prep this for next week! Definitely a great lunch option to brighten your workday. Thanks for sharing! Such a great lunch option! I hope you love it! It is so good. Thank you for sharing this post. A mistake I made which also should probably be put in notes somewhere is to de-seed the chipotles for less spicy….I can handle mild but this is way to spicy for me. Hi Celia: The peppers typically aren’t that spicy especially when mixed in tomato sauce. Traditionally you do not deseed them. Can you use FAt Free mozzarella cheese. My husband is on a cardiac diet so not a lot saturated fat for him, and I really wanna try this. Also I’m not a fan of mushrooms is there something you can suggest to substitute them with. Thanks! This is a wonderful, quick and easy recipe! Made it last night as my lunch meal-prep for the week, and it’s delicious! I couldn’t find chipotle peppers at Trader Joe’s so just used your 10-minute enchilada sauce. So good, so flavorful, and reheats well! Will definitely add this to my rotation. Thanks, Monique! I’m so glad you loved this one! I’ve made it a few times for lunches / dinners and agree that it reheats so well. Thank you, Rosette! So much protein and fiber in this meal I love it! I don’t tend to like a ton of heat so I used 2 tbsp of adobo sauce instead of the actual peppers. It was perfect! 10/10 Loved it. Perfect! So glad you enjoyed. Incredibly tasty meal! I used half the amount of tortillas to cut down on calories (still covered everything fine! ), and ate it with a squeeze of fresh lime and sour cream. Absolutely will be adding this to the recipe collection! Perfect! So glad you enjoyed this one, Chelsea! This was yummy but 2 x TBS of chilli powder plus chipotle in just one can of tomatoes makes it HOT. I only used 1 x TBS chilli powder and it was still quite spicy. Hi Linda! The great thing about this is that you can adjust the spice to your tastes (I have a huge love for spicy food myself 🙂 ). Feel free to go light on the chili powder! I just made this and it came out extremely well. I love that the sauce comes together in the food processor/blender, rather than requiring lengthy simmering. So tasty, and just the right balance of spiciness and cheesiness :). Thanks for the recipe! Perfect! I’m so glad you enjoyed this one. And yes, such a delicious, quick sauce! Delicious! Even my meat loving husband declared this a winner! Does this freeze well? I was thinking about making it in two smaller dishes and freezing one…. Yes this will freeze just fine! i want to try this! it sounds delicious. My son has a nut allergy so any suggestions for avoiding the almond milk? Would this work in the slow cooker? 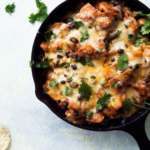 Made this today but I replaced the tortillas with sliced zucchini and added in a can of retried pinto beans – delish! 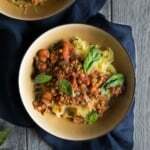 This looks wonderful and perfect for us vegetarians! We live out in the middle of nowhere deep in the Ozark Mountains. It is over an hour drive to the closest grocery store. So I get super excited when I see a recipe that looks delicious and I read thru the ingredients list and find that I have every single item in the house!!! YAY! I’m making it tonight. I’m going to use Queso Fresco cheese instead of Jack. I’ll let you know how we like it! Thanks! Amazing!! Hope you guys love this one 🙂 all about the simple ingredients for dinner! This was fantastic! I really enjoyed the corn tortillas in between those cheesy, saucy layers of veggie goodness. They hold up so much better than flour in recipes like this. And the sauce was perfectly spicy when mixed in with all the layers. 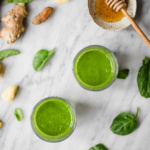 I will definitely add this to my regular meal rotation! My corn tortillas were mushy. Was this because I made it, froze it then thawed and baked it? I had read in the comments that it froze well. Perhaps I shouldn’t have thawed it first. What do you think? Since the tortillas are completely covered in sauce, they will be on the softer side. If you want them to hold up more, you can use less sauce next time! I’m not sure if freezing has a huge result but it definitely could have. I made this over the weekend and it’s super flavorful! Such a great way to pack in a ton of vegetables. We really enjoyed it ‘as is’ but may also try a version + chicken. I will be using this quick and simple enchilada sauce in other recipes too! Thanks! Love this one for getting plenty of veggies in! It will be delicious with chicken too (and that enchilada sauce is amazing on tons of recipes). Delicious! Nice, smoky heat (I’m a spice fan) complimented with different textures. I was a bit worried about the corn tortillas but I actually enjoyed the softness and flavor. I’m looking forward to my leftovers. Thanks! I’m a big spice fan, too 🙂 Glad you loved these!